This simple salad tastes like summer in a bowl, with fresh watermelon, beets, basil, olive oil and vinegar. To turn it into more of an entree, add cubes of feta cheese or crumbled goat cheese. 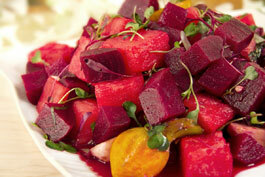 Roast beets in 375 F oven until tender and knife tip can be inserted easily, about 1 hour. Peel and dice beets when cool. Peel and cut watermelon in ½-in. dice. Cut basil in chiffonade and gently fold together with all ingredients in large bowl. Season to taste and let salad macerate for 30 minutes in refrigerator.